When planting her front yard floral extravaganza, Racine, Wisconsin, gardener Kris Reisdorf paints a picture with annuals that&#x27;s every bit as enchanting as a traditional perennial border. &quot;I aim to create a garden that looks old-fashioned and has lots of wonderful things to pick from for making bouquets,&quot; she admits. And while the look appears wholly unstructured, there is a definite plan. Learn her secrets-and then sow your own patch of blooming nostalgic beauty. Sow your seeds ahead of time, so that when it's time to design the garden and actually plant, you have plants in hand. This will jump-start the bloom show and will also help you know exactly where you are placing plants, which is so key when interplanting annuals. Soldier-straight rows and hard corners won't create a garden that's romantic and wildly old-fashioned. 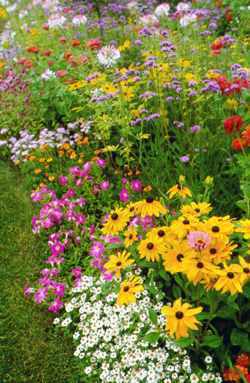 Give beds curves and dips, and plant flowers in driftsand odd-shaped clusters. In Kris' garden, beds vary in width from 6 to 10 feet and are viewed from both sides. This means that taller plants go to the inside of planting areas; short bloomers fit in at the edges. 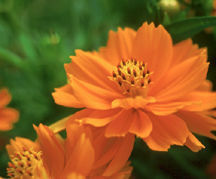 If flowers are grown against a wall or shrubbery backdrop, place tall bloomers in the back, shorter ones in the front. Plant contrasting flower types side by side. For instance, mix tall, spiky plants, such as 'Victoria Blue' salvia with round-flowered petunias. Also, pair colors that are eye-pleasing: white zinnia and red celosia, yellow marigolds and cosmos, rose cleome, and purple heliotrope. "It's important for a garden to have good rhythm, so your eye travels the whole length of the bed, especially with one that's 50 feet long," Kris laughs. "Accomplish that with color." How? Don't cluster flowers of one color together in one part of the garden. Instead, repeat color blocks throughout the planting area, running them back to front and all down the length of the bed. 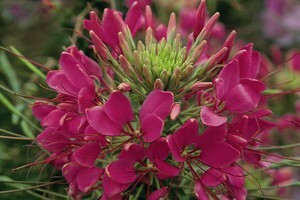 That cleome is such a great color. I have a serious weak spot for those hot pinks.